Brace yourself. 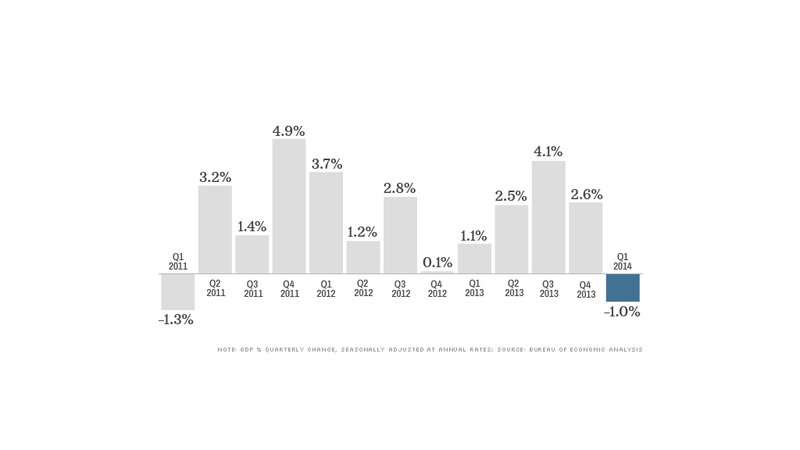 The U.S. economy looks like it went on a roller-coaster ride at the start of the year. Revised numbers released Thursday show the economy shrank in the first quarter, marking the first downturn since early 2011. Gross domestic product, the broadest measure of economic growth, fell at a 1% annual pace, according to the Bureau of Economic Analysis. A slump was entirely expected, and economists aren't too worried. They forecast a bounce back in the spring. Take for example Joseph Lavorgna, chief U.S. economist at Deutsche Bank. He predicts the economy will rev up, growing at more than a 4% pace in April through June. In a note to clients this week, he cautioned investors not to worry if the first quarter numbers were lousy. The January through March period tends to be the slowest for growth, he noted, and this year, colder than usual weather stunted retail sales, international trade and the housing market. Businesses also cut back on investments in new equipment and buildings, and state and local governments reduced their spending. The downward GDP revision came primarily from a decline in business inventories, meaning companies weren't quick to re-stock their shelves or stockpile goods to prepare for future sales. Stuart Hoffman, chief economist for PNC Bank, points to the auto sector as an example. When snow and ice kept customers away from auto lots in the winter, automakers slowed their production lines. "There were too many unsold cars on the lot, so they cut production, and that holds the economy back," Hoffman said. "Now those cars are selling again and production will come back." Indeed, data released in the last few months now shows auto sales are booming, both the manufacturing and services sectors are improving, and job growth is solid. "The first quarter was disappointing, but rather than view that as an omen of a recession or the first of a down leg in the economy, I see the seeds of a big bounce back in spring," Hoffman said. It's important to remember that the first quarter GDP numbers aren't final. They will be revised by the government at least two more times over the next couple of months. The government initially said first quarter GDP grew at a 0.1% annual rate. Today's figure is a revision.